Your Dirty & Stained Roof May Cost You Money! Aqua Boy will restore your curb appeal & prevent premature ageing of your roof. Get a FREE INSTANT Powerwashing Quote TODAY! Aqua Boy Power Washing is a full service Power Washing and Soft Wash Roof Company. We have invested in the very best state-of-the-art-equipment and cleansers to exceed your expectations & stay in budget. With our uniformed educated staff, we are committed in bringing our customers the highest level of service. Call now for a free estimate and information on the service we provide. Aqua Boy will have two uniformed qualified staff on every Roof Cleaning Job. One worker will be ground level watering your landscaping and assessing any if all overspray. The professional cleaner will follow all Aqua Boy safety standards while performing the cleaning process. Aqua Boy will repeat the entire process to ensure the highest results possible (if needed). Aqua Boy’s training and education in the Soft Wash Roof Cleaning business makes us shine above the rest. Plants, Trees, Flowers, shrubs & your lawn are Aqua Boy’s major concern. Aqua Boy seals all gutter down spouts and conducts a complete assessment of your property before starting. We spend the time pre soaking your landscaping and covering whatever needs protection. Our reputation and customer relationships are built on producing the highest quality of work. Protection of your landscaping is vital. We pride ourselves on our methodical and professional ways. Those ugly black streaks are known as roof algae or the scientific name Gloeocapsa Magma. They cause stains and streaks on your roof. The bacteria build up over time and feed on moisture and calcium carbonate in the ashphalt shingles. This growth causes black stains as the cyanobacteria develop their dark UV-protective coating. These stains take months or even years to appear, but once present they are here to stay until Aqua Boy wipes them out! CLICK for a free estimate. Customers LOVE Aqua Boy Powerwashing! Our home in Voorhees was powerwashed by Aquaboy Powerwashing & they did a GREAT JOB! They soft wash cleaned our roof, pressure washed our sidewalks and patio and even did our pool deck! 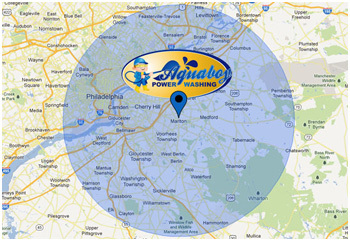 If you live in Voorhees, Berlin or Malton, please have your hose powerwashed by Aquaboy! They were professional and got our roof and hose very clean! We highly recommend them! I’m giving you 5 stars!! Thank you Aqua Boy for cleaning and powerwashing our roof and sidewalks! Next time I am having you out to clean our deck too! Aquaboy’s soft washing got our roof sparkling clean! No mess to clean up and our roof now looks amazing! Now our home in medford looks the best on the block! Call Aquaboy for all your roof cleaning and powerwashing needs! Aquaboy came to the rescue! Our roof in Moorestown was so dirty you could barely see the shingles anymore. Aquaboy’s Soft Wash Roof Cleaning system did the job! Our rood looks brand new again. If you live in Moorestown or the local area (Mt. laurel, Marlton, Voorhees or Medord), we highly recommend them for powerwashing! Clean, professional & affordable. Thanks Aqua Boy! Thank you Aqua Boy! Your powerwashing made our home look BRAND NEW again! Not only did you soft wash our roof to perfection, our vinyl siding and concrete driveway looks amazing! We highly recommend aquaboy powerwashing and roof cleaning! They did such and amazing job we will definitely use them again! Aquaboy Powerwashing came to our home in Berlin, NJ for an estimate. Not only was their estimate affordable and accurate, but their powerwashing and softwashing of my home and roof was excellent! Our home looks great now! We can’t thank you enough Aquaboy! Please come and powerwash our house and softwash our roof every spring! Get a FREE No-Obligation Quote from Aquaboy TODAY! Cleaning and Powerwashing services are unmatched! Our company has years of experience to bring to your next cleaning project. and a personalized FREE quote!